Our Special Services show The Dayton Difference in action. They can be the little things that make a big difference later down the road. Or they can be the extra peace of mind that makes your company rest easier. From customized service to extra guarantees to specialized equipment that further protects your shipment, Special Services are the extras that our customers have come to rely on for a premium shipping experience. To reduce freight damage during loading and transport, you can receive extra protection with Dayton Freight’s deck bar trailer configuration. Most of our trailers are equipped with deck bars that work horizontally and vertically to ensure freight safety. Adjustable in height, and with generous weight allowances, deck bars provide the best use of space while preventing shipments from being loaded on top of one another. This special service is just another example of Dayton Freight’s commitment to safety and claims-free transportation. Ideal for locations without docks, our well-maintained liftgates are an effective way to handle freight. They are invaluable during loading and unloading, and increase our ability to pick up and deliver your freight quickly and damage-free. Residential area delivery is an option for you, thanks to a variety of equipment. Straight trucks and liftgates make it possible to maneuver into neighborhoods or tight storage areas. Whatever your needs, or final destination, Dayton Freight can deliver. Simply put, you get your shipment when agreed upon, or it’s free. No claims to file, no invoice, no hassles for you. You have our word that if your shipment is not delivered by a stated time, it’s free of charge. That’s the certainty we have in our people to come through and deliver on time. It’s also the trust you can place in Dayton Freight to meet your shipping needs each and every time. That’s the On The Double Guaranteed Service. To better serve our customers, Dayton Freight offers cargo insurance for freight moving over land throughout the United States and Canada. 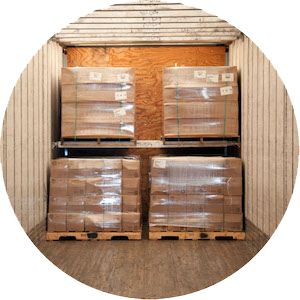 The insurance covers up to 110% of the sum of the invoice value of the shipment plus freight charges. Coverage begins once Dayton Freight picks up the shipment and continues until it arrives at its final destination, including areas serviced by our Strategic Partners. In the unlikely event of loss or damage, your shipment is covered for the full insured value with no deductible. For rate quotes and more information, please contact Customer Service at 800.860.5102. If the clock is ticking, you’ve come to the right place. DFXpedited Service has got you covered with the most time-sensitive shipping options to meet your deadlines. You can call us 24/7, and we will immediately plan the best, quickest way for your shipment to reach its destination. Numerous options are available to you: ground, air, same-day, next-day, covering all of North America. The choices are yours, and the delivery will always be safe, secure and extremely rapid. Based on our customers’ needs, Dayton Freight provides a variety of assembly and distribution services. For assembly customers, Dayton Freight will pick up shipments from a variety of vendors and consolidate them into a single shipment for delivery. For distribution customers, truckload quantities are received at the most centralized Service Center based on your customers’ locations. Shipments are then loaded for next-day delivery to your customer.